"After Brown, 43, and his family were evicted from their northeast Greensboro home earlier this month, he turned to the public library and its computers for answers. Once online, he couldn't find what he was looking for: advice from someone who was homeless." "So, he took up the task himself. He began posting to a Web log, or blog. There, he began to tell his story -- how he became homeless and how he was dealing with it." "Since I currently have no car, I do a lot of walking; I've passed under a lot of bridges, and the relatively slow pace gives me time to really scan for signs of human habitation. The evidence is not under all bridges, but it's under enough of them to give some idea of the scope of the problem. It's usually something subtle: an abandoned blanket, a cardboard box strategically placed, perhaps some old camping gear (usually an indicator that its owner isn't too far away). I've only once actually glimpsed someone sleeping under a bridge. I wasn't homeless yet myself at the time, so of course, the only thing that ran through my mind is "there but for the grace of God go I." MC Hammer is blogging on blogspot — check it out! He's using Blogger Mobile to post photos via his Sidekick, and is using Audioblogger to post audio clips. I’m really excited to introduce you to the Blogger widget, one of the three widgets for Mac OS X 10.4 now available on Google Labs. This li’l guy makes it even easier to post to your blog from your Mac: pop open the Dashboard (F12 usually works), type some text, press one of the alluring, shiny buttons, and then spend the next few minutes flipping widgets back and forth from front to back because the animation is so cool. If you have multiple blogs, you can have multiple Blogger widgets open, each one tuned to its own blog. And, if space gets cramped, just click the blue title bar at the top of the widget to collapse it up, window shade–style. The text box works pretty much like Compose mode in the full editor on Blogger. You can type HTML tags in there, but also use ⌘-B to make words bold and ⌘-I to make them italic. If you start a post in the widget and then realize you need to add a picture or do something else that you need the full editor for, just save your post as a draft. A link will appear that’ll jump you right into Blogger to pick up your post where you left off. The widget checks periodically to see if there’s a newer version, so if we fix bugs or add new features you’ll be sure to know. Your password gets stored in the Keychain, so it’s nice and secure. If you need any help or have any cool widgety ideas, we’ve set up a special Google Group for the Mac widgets. Don’t forget to check out the other two widgets, too: Gmail and Search History. They’re really slick and I think you’ll like them a lot. 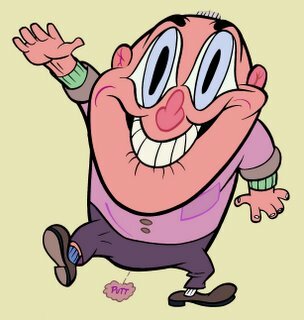 John Kricfalusi, the creator of Ren & Stimpy, has a Blog*Spot blog! Hi, everyone - it's Andrea from Blogger Support here. I'm very excited to announce the launch of our new Blogger User-to-User Help Group. It's a new community on Google Groups that will let you talk to other Blogger users, ask questions, and share your blogging expertise. In the group, you'll be able to get all kinds of help with your blog - from template customization and HTML to publishing tips and troubleshooting advice. There's even an area to share your own, beautiful blog with other users! To access the group, just click here. If you don't already have a Google Account (like Gmail or AdWords), you'll be prompted to sign up for one. And, of course, it's all free. I'm really happy our team is able to provide this for you, and I hope you enjoy using it as much as we enjoy your blogs! for documenting their research in Tanzania. What's especially neat is that they've tied the blog to Google Earth. So you can click on a Google Earth file from the blog and read a detailed description of the ongoing studies in the context of where the research is being conducted. Here's an example kmz file. Plus, there are pictures of chimps. The Jane Goodall Institute has started a Gombe Chimpanzee blog for documenting their research in Tanzania. My first post to my blog was a little paragraph about my obsession with cycling, and I remember feeling a little ... let down. … It wasn't until someone left a comment that I was hooked. An audience! Someone is reading! It was this feeling that led to the idea of Measure Map. Our goal has been to use the power of web analytics to help bloggers feel that same sense of connection with their audience. Today, as the Measure Map team joins Google, our mission remains the same: to build the best possible user experience so people can understand and appreciate the effect their blogs - their words and ideas - can have. Bill and I now judge events in our lives as to whether they are blog-worthy. When we’re together, we have an unspoken agreement as to who gets to blog about whatever cool thing we encounter. … And he’s crestfallen if I haven’t read his entry before we go to bed. A remarkably specific ettiquette is emerging in this uncharted land. Listen at Odeo.com, or download the MP3. on a group of post-consumerists and their vow to "not buy anything new in 2006 -- except food, health and safety items and underwear." Fortunately, Blog*Spot is free so the group, called Compact, can happily blog away. The SF Chronicle reports on a group of post-consumerists and their vow to "not buy anything new in 2006 -- except food, health and safety items and underwear." Together we're building a guide to women bloggers. In 20+ popular topics, you'll find lists of blogs by women and constantly updating guides to what's hot, written by our contributing editors.